So, you’ve bought Splatoon and decided to become a squid kid. I don’t blame you. But do you know the ins and outs of ink warefare? Do you know when to shoot and when to squid? Do you even know where to begin!? Luckily, I’ve created a guide for those of you new to title. It’s not the hardest game to pick up, and some of the tips may seem like common sense, but there’s a lot to assess when you’re trapped in a chaotic cluster of aquatic artistic assassins. I bet you’re sweating already, you salty squid dog. What’s a shooter without some big guns? And rollers. And sprinklers. Ok, maybe this isn’t your average bullet storm shoot’em up. The point is that Splatoon has weapons. Lots of ‘em! These weapons fall under three main categories - long range chargers, mid-range shooters and close range rollers. Each weapon type has variations based on abilities such as range, rate, attack and mobility. Not only that, each weapon also has a sub-weapon and a special attack. These can both be vital to using your ink in the best way possible. The key is to try them all. You may find a combination of weapon, sub-weapon and special that works better for you than others, but you won’t know until you try. Heck, you can even test out weapons in their entirety before you buy them in Sheldon’s shop. It’s a very handy way to see if a weapon is the right fit for you. If you do take it into battle don’t be afraid to try different approaches. Worst case scenario you get skunked and you try again. Once you’re done selecting the right type of weaponry to lay the smack down on your opponents it’s time to pick out some stylin’ duds. Squids are fashionable. If you’ve watched any nature documentaries on the under-sea mollusks you would know this. Not only do fresh new shades and sick kicks look good, they also give your inking special abilities. Each accessory and piece of clothing has a star rating that denotes how many extra abilities that particular item can hold. Aside from the main ability you must unlock the others by scoring so many points in online play. It doesn’t take long though. The most stars a piece of gear can have is three, so be sure to pick out the most attractive AND high ranking items in the local boutiques. Press X in the shops to read up on the item abilities so you can mix and match gear for the strongest possible set up. Or just pick your favorite look and make those other squid posers jelly. 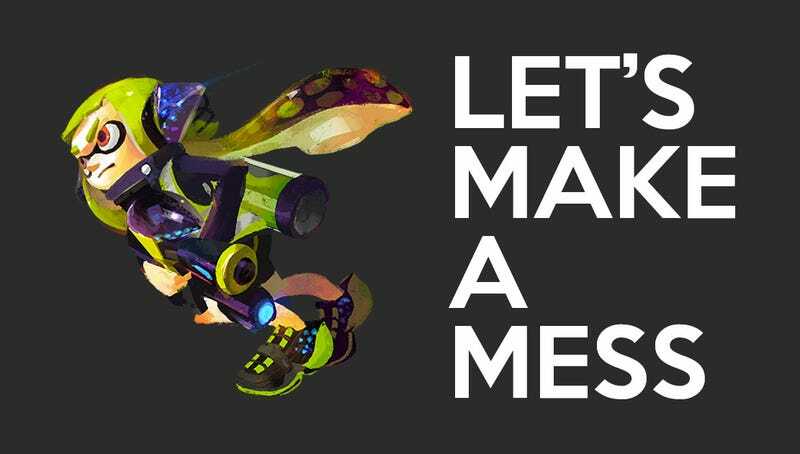 Chances are when you start playing Splatoon you’re going to think, “I need to cover the ground with paint, I better aim at it!” You’re not wrong in this mind set, as it is your goal to ink as much territory as possible. The problem is that when you aim directly at the ground that’s all you’re going to hit. If you aim ahead you can cover a lot more ground aaaaand give yourself a helpful paint getaway route. Also, you’ll hopefully be able to splatter some ignorant opponents. It’s a no brainer, but I can’t tell you the amount of times I come upon a poor unsuspecting fool who is blissfully smearing the ground around his feet. Aim high, young inkling. Splatter the sky. Where is your ink meter? It’s not in a corner of the screen. It’s not on the GamePad. It’s on your back, silly! That’s right, your ink meter is, in fact, on the back of your inkling. Keeping an eye on it can be difficult at times, especially if you get too close your character. Refilling your tank is as easy as taking a dip in your ink. This seems like a simple mechanic, but there are times where you simply forget because you’re on hot streak or backed into a corner. You don’t want to find yourself inkless and stranded in enemy territory. So keep an eye on your tank and use your best judgement on when to refill in a spill. Look at your GamePad. Now look back to this article. You may have notices that it has a screen. Who knew?! That screen is full of helpful information in the average Splatoon match. Things like your teams location, current ink coverage and where you’d like to drop that large missile on your back can all be seen on the Wii U’s lower screen. The issue is that there’s always a lot happening on the main screen (aka your television) and it can be hard to find an appropriate time to glance down at your controller. But you should. It can help you gauge what parts of the map need the most attention and which to avoid. Always check your GamePad if you get splatted by an opponent. Those four or so seconds that it take for you to respawn may be enough time to formulate a devious plan. A plan of revenge! In Splatoon you have two options about what you can be. You can be a squid. You can be a kid. You can’t be both at once, so quit asking. Most players get caught up in the mayhem of splattering ink all over and they forget to squid about. This can cause many problems, for you see when you’re a squid you can refill your ink tank (pay attention, we covered that already) and you can swim around in your teams ink. You are twice as fast in the ink as you are on your worthless humanoid legs. Scooting around at top speed is helpful for getting places and for getting away from opponents. Instead of quivering in fear in a pool of your own ink when a roller bears down on you, simply drop into squid form and leap over him. Now you have the upper hand! Or tentacle. Handtacle? Don’t forget about squid-hopping! By touching the name of a teammate on the GamePad you can jump directly to their location. Newbies seem to think this is something you can only do after you respwan, but it’s an ability you can pull off at any point. In danger? Jump away! Need to help a friend? Jump away! Feel like touching someone’s name because you’re lonley? ...Jump away! Here’s one that I tend to forget in the heat of battle. In online Turf War the only part of the map that matters as far as “who covered the most” is the ground. This means that spending all your time and ink splattering walls is useless unless those walls are leading to a new area. Once you can control your weapon well enough to focus on the floor you’ll find yourself racking up way higher points in matches and helping your team that much more. Just for the record, ramps are not walls. So if you find yourself in BlackBelly Skate Park you should douse all those half pipes and sweet jumps if possible. Follow these seven tips and I GUARANTEE* that you’ll improve your Splatoon scores and rankings. It’s a big bright world out there full of squids. Murderous squids with a thirst for ink. Ink with your name on it. It’s time to show them what you’re made of. You can do it! *Not a real guarantee. Results may vary. Consult a doctor if skills degrade.